Do you reside or work in Miramar, Florida and are you looking for a custom signs company in your area? Look no further than the professionals at Testa & Sons Signs. 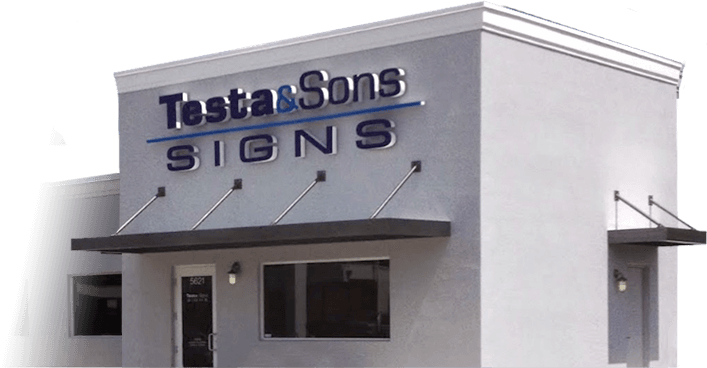 Located in nearby Hollywood, FL, Testa & Sons Signs has been in business for decades and has been serving businesses in and around Broward County with their custom sign design and installation services. At Testa & Sons, we are proud of our high quality finished signs in Miramar. We take the time to make sure that each of our signs are manufactured in excellence. Customer satisfaction is highly important to us, and we even extend our services to properly installing our signs because we want you to have the best, long lasting signs. If you are looking for a company that specializes in business signs Miramar, look no further than the sign installation experts at Testa & Sons Signs. We have been serving the entire South Florida region, including Miramar, for decades and have been helping many businesses just like your shine with a brand new, custom designed business sign! When you choose Testa & Sons as your sign manufacturing and installation company, you get the best service available to you. We truly care about helping each of our customer’s to have a great sign in Miramar. Call to speak with one of our experts today!